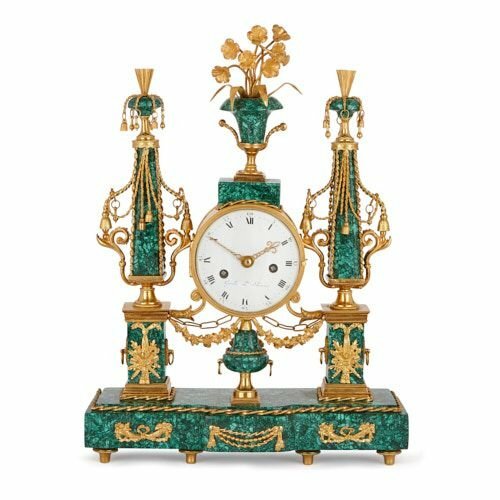 This beautiful malachite clock features an abundance of classically-inspired ormolu motifs, including cornucopias, urns, obelisks, and foliage swags. This mantel clock was crafted in the Louis XVI period, but the malachite veneer was a recent addition. 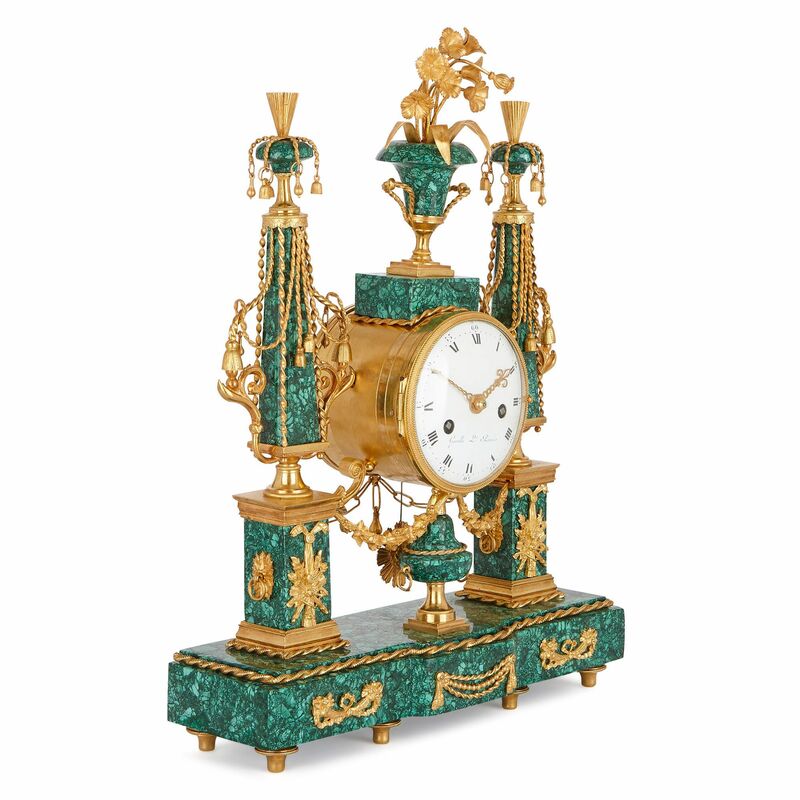 The clock is placed on a shaped malachite base, set on eight ormolu toupee feet. The front of the base is mounted with ormolu motifs, which take the form of a tasselled rope swag, flanked by two crossed cornucopias. The top of the base is edged with an ormolu twisted rope form. Two ormolu obelisks, set on plinths, stand on the malachite base. 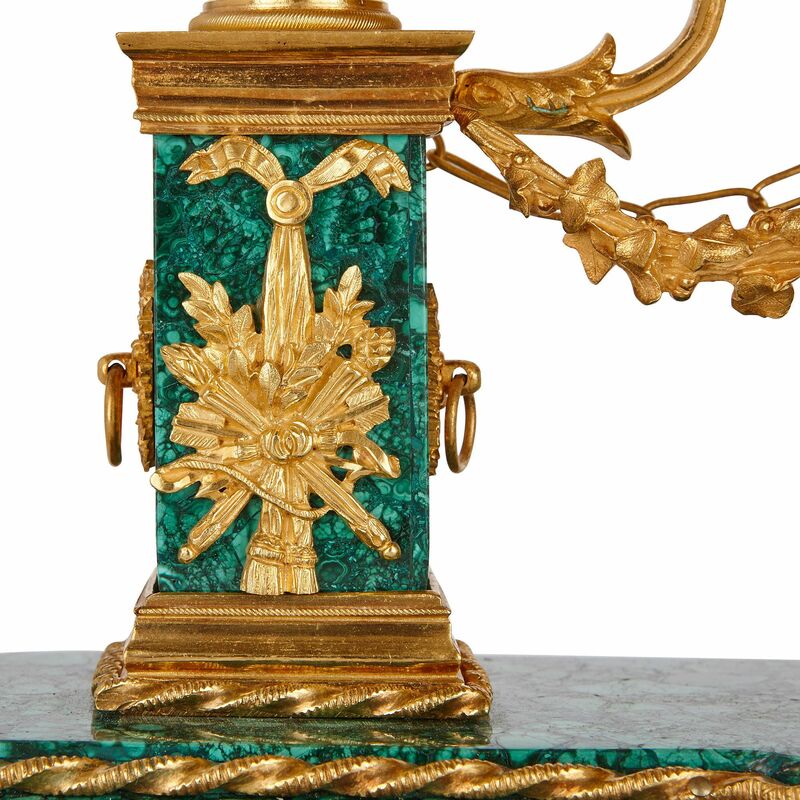 The malachite plinths have ormolu tops and bases, and are mounted with ormolu motifs, depicting crossed burning torches, quivers of arrows, and laurel leaves, tied with ribbon. The plinth sides are set with ormolu ringed handles. Above, the obelisk bodies are set on splayed ormolu feet, fitted with free-standing scrolled, foliate shapes. The bodies of the obelisks are veneered in malachite, and edged and draped with ormolu tasselled ropes. 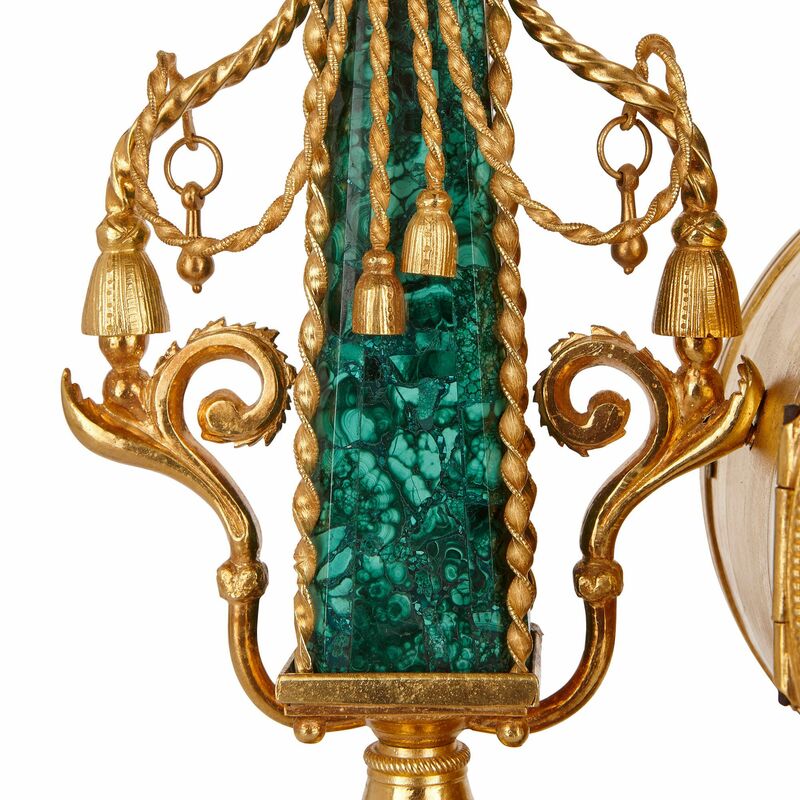 They are topped by malachite urns with ormolu flourishes, which are fringed with ormolu ropes, tied with bells and beads. A circular white enamel clock dial occupies the space between the two obelisks. This is placed above an ormolu-mounted malachite urn, which is linked to the flanking obelisk plinths by an ormolu foliage swag. 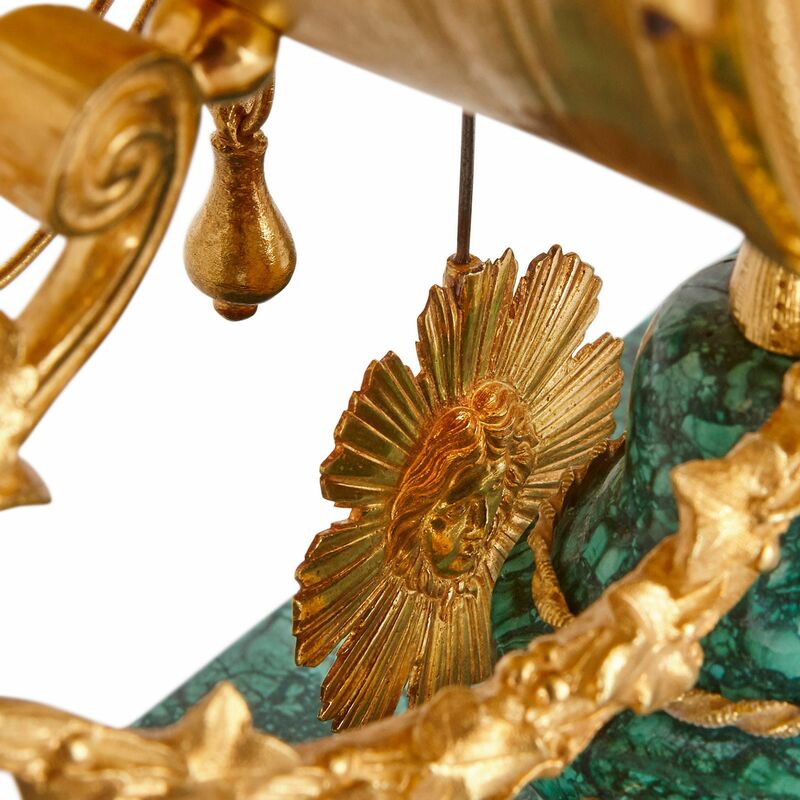 The clock’s pendulum, which terminates in an ormolu sun-burst motif, hangs behind the malachite urn. The dial is inscribed with Roman Numeral hours, and Arabic Number minutes. It is signed with the maker’s name, ‘Gavelle Lne A Paris’. This dial is placed within a cylindrical ormolu case, which is topped by a miniature vase. 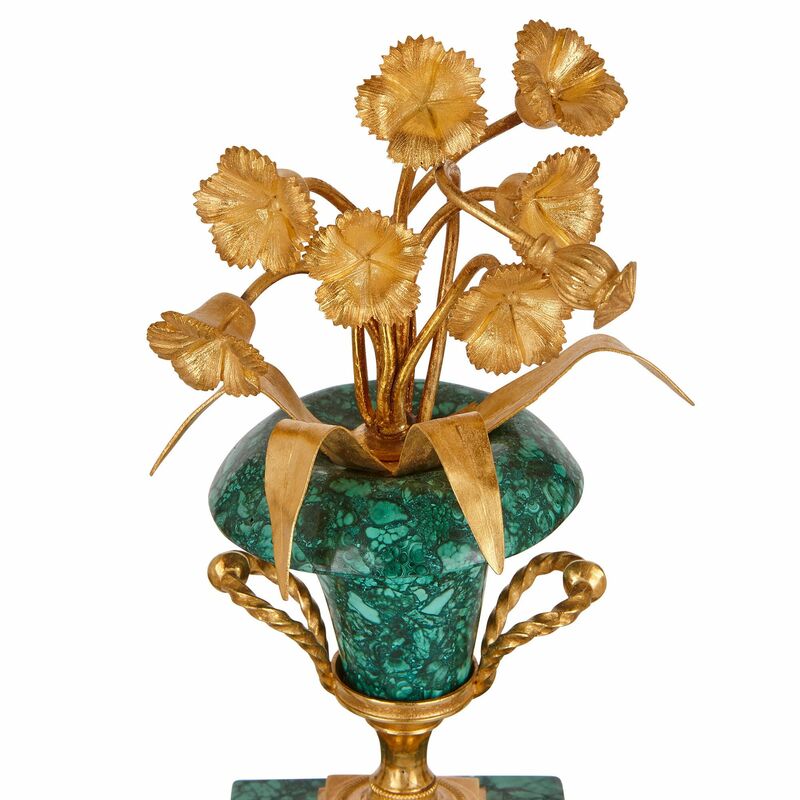 This malachite vase stands on an ormolu stem, mounted with twin ormolu handles, and set on a rectangular, malachite plinth. The vase is full of flowers, which have been delicately crafted from ormolu. This mantel clock was crafted in the late 18th Century by the Parisian clock-maker, Pierre Gavelle, also known as Gavelle L’Aîné. 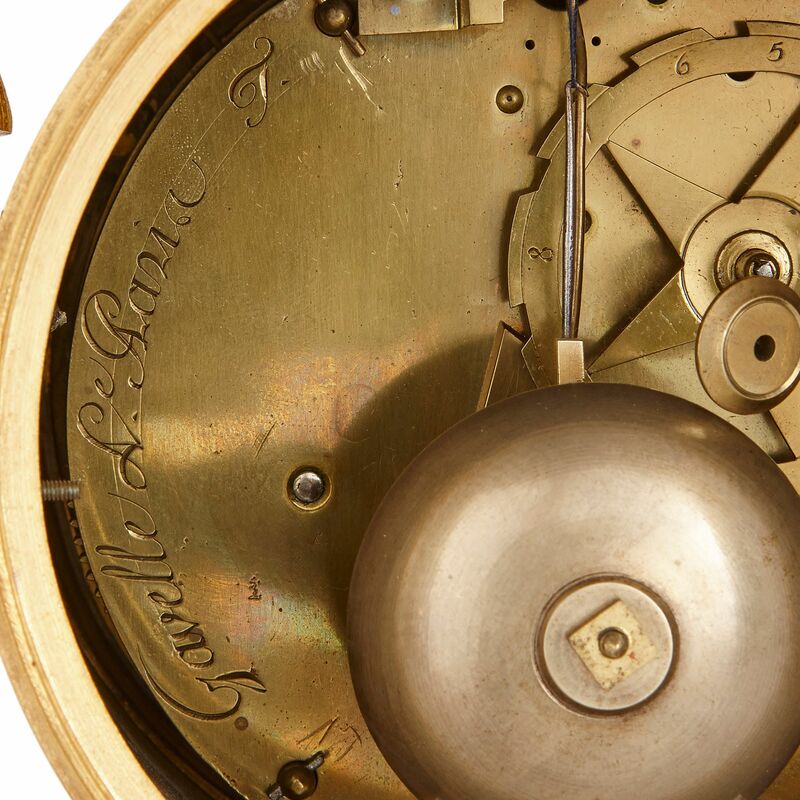 L’Aîné was the son of the prestigious watch case and clock maker, Jacques Gavelle. L’Aîné became a famous clock-maker in the late 18th Century, and was made député of his guild, like his father was before him. 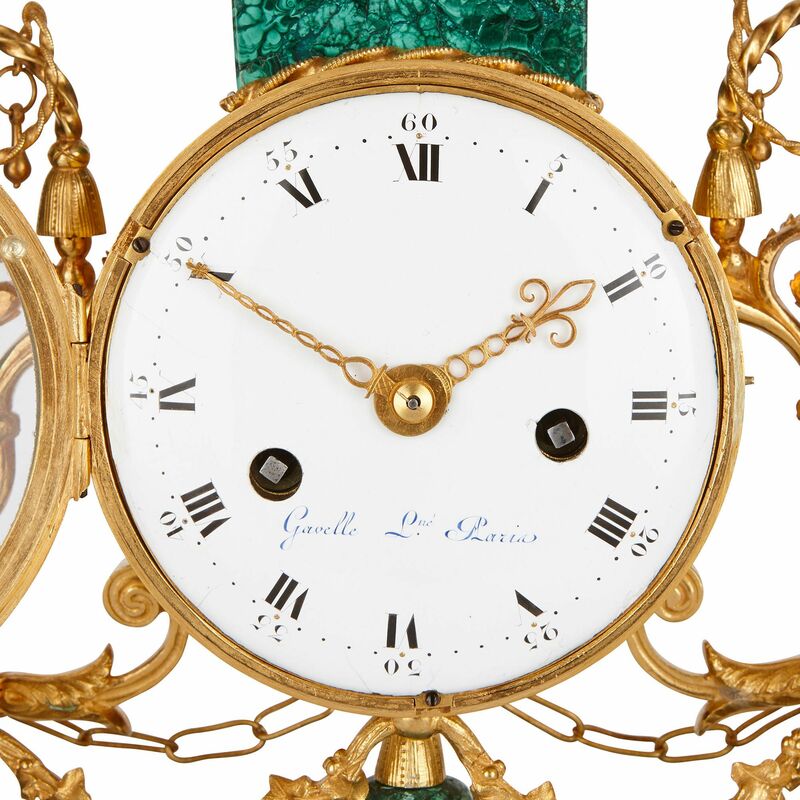 Today, Gavelle L’Aîné’s clocks are found in major public and private collections. For instance, one is held in Windsor Castle, in London, where it is cared for by the Royal Collection Trust. A similar clock is in the collections of the Pavlosk Palace (inv. no. 1190 - IV), illustrated in A. Alexeieva, Pavlovsk, the collections, Paris, 1993, 185, fig. 10.